I first drove the Lexus NX in 2014 during a pre-launch event in Seattle. Two years later, I got to drive an actual production model – the 2016 Lexus NX 300h. After one week behind the wheel, I’m still impressed by the sporty crossover SUV. It’s powerful, daring in design and a true original. Lexus loaned me the vehicle to drive to the U.S. Men’s Clay Court Championships in Houston, TX. The event was held at the River Oaks Country Club. For those of you who don’t know, River Oaks is one of the most expensive neighborhoods in Houston and the place where President George Bush calls home. When I pulled into the parking lot, I saw rows of Porsches, Bentleys, Mercedes-Benzs, and Ferraris. Fortunately, the NX looked right at home among these high-end luxury vehicles. The NX design features a fastback shape and sharp angles. This new design has been a bit polarizing among Lexus enthusiasts – some love it, others hate it. The most controversial design element is the grille. I showed it to my father-in-law and his first reaction was YUCK! I actually like the design because it gives the vehicle a more aggressive look. The interior of the Lexus NX is more conservative than the exterior, with dark grays, matte wood grains and muted silvers. The upholstery is suitably soft and sophisticated, as is the trim and they contrast well with the sharp metallic accents. 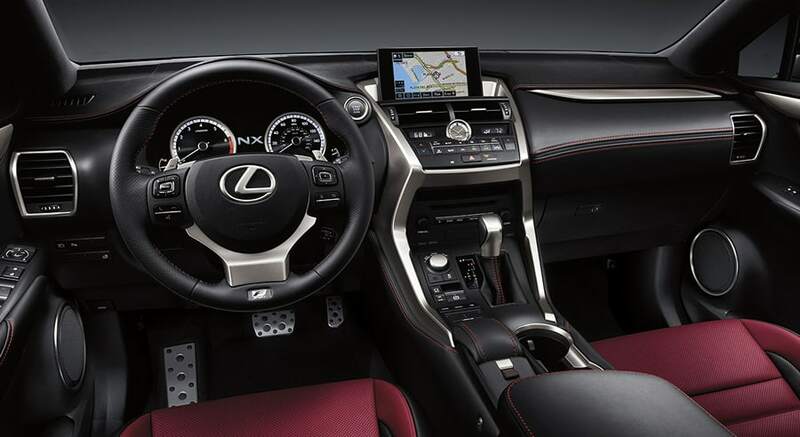 The seats in the Lexus NX are comfortable and the cabin offers more than enough leg room. The rear seats have plenty of room and there’s more than enough cargo space in the hatch. There’s a useful privacy shelf available too. The 2016 Lexus NX 300h is also equipped with tons of luxury features such as a power steering wheel with tilt-and-telescoping, automatic LED headlights, eight-way power front seats, HD Radio, 8-speaker premium audio, an auto-dimming rearview mirror, rear climate vents, 17-inch wheels, LED foglights, rear privacy glass, keyless ignition and entry and heated mirrors. You can select options such as a power rear hatch, auto-dimming outside mirrors, illuminated door sills and leather heated steering wheel. 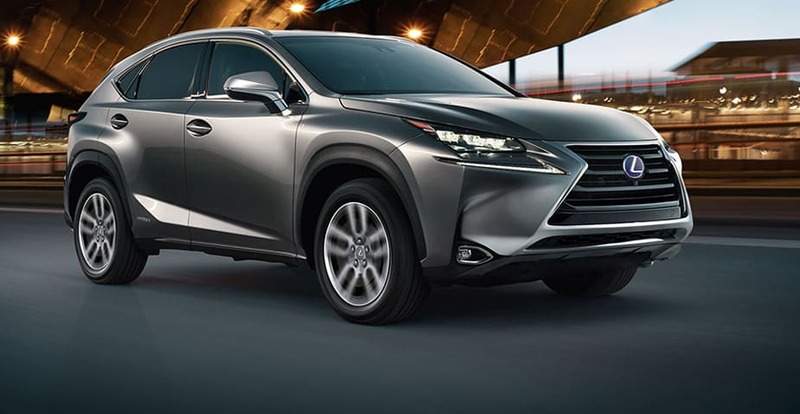 The 2016 Lexus NX 300h is a hybrid that is powered by a 2.5-liter four-cylinder engine as well as a pair of electric motors that give you 194 horsepower. The Lexus NX’s hybrid system is connected to an ECVT (Electronically Controlled Continuously Variable) Automatic Transmission. It is highly fuel efficient, and according to the EPA offers 33 mpg for cities, 30 mpg for highways and 32 mpg with the all-wheel drive. The EV mode allows you to drive the 300h on full-electric at a speed of 30 mph or lower, for up to a mile. This is perfect when you’re driving in heavy traffic or looking for a parking space. One thing you will notice when you drive the 2016 Lexus NX 300h is that it is extremely quiet when in the EV mode. Lexus engineers created engine noise that you can pump through your speakers if you want to hear a bit of engine rev. Once again, this is one of those features that have divided Lexus fans. Some prefer the quiet, others like the noise. I feel as if the feature is a bit contrived. Overall the 2016 Lexus NX 300h is a solid vehicle that would work well for young professionals. The five-passenger crossover is great for a city round-about and is well suited for most terrains. It offers excellent fuel economy; it’s fast and nimble and offers a fun driving experience.